The Eastern Africa Land Administration Network (EALAN) plays an important role in development and support of Land Administration education in Eastern Africa. The Network was formed in 2009, out of interest and informal agreement by four universities in Eastern African Universities to support each other in offering Land Administration related programs. The interest to network was motivated by lack of qualified land administration lecturers across the eastern African countries. 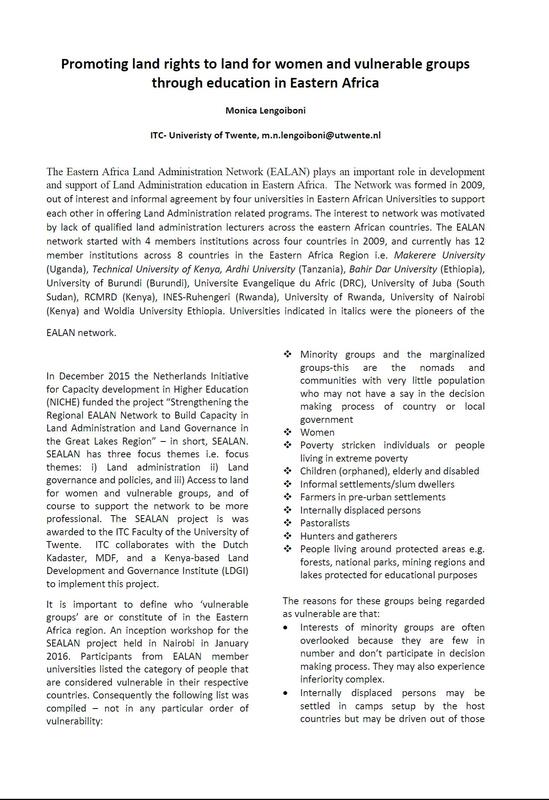 The EALAN network started with 4 members institutions across four countries in 2009, and currently has 12 member institutions across 8 countries in the Eastern Africa Region i.e. Makerere University (Uganda), Technical University of Kenya, Ardhi University (Tanzania), Bahir Dar University (Ethiopia), University of Burundi (Burundi), Universite Evangelique du Afric (DRC), University of Juba (South Sudan), RCMRD (Kenya), INES-Ruhengeri (Rwanda), University of Rwanda, University of Nairobi (Kenya) and Woldia University Ethiopia. Universities indicated in italics were the pioneers of the EALAN network.